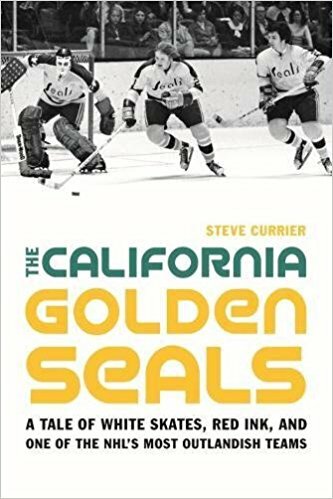 While doing research for my soon-to-be released book, The California Golden Seals: a Tale of White Skates, Red Ink, and One of the NHL’s Most Outlandish Teams, I discovered the NHL has published several wildly inaccurate statistics concerning my favourite defunct franchise. I always knew the NHL never officially kept track of shots on goal, but after doing a little research I realized the league had a hard time keeping track of many other stats as well. After perusing fellow SIHR member Sebastien Tremblay’s Goaltenders: the expansion era (1967-1979), I was amazed to learn how much his statistics varied from what the NHL had always published concerning shots on goal, wins, losses, ties and games played. You would think it would have been easy for someone at the league offices to keep track of such a simple statistic, but for whatever reason, it wasn’t. Complicating matters further, I later realized while looking through Jeff Z. Klein and Karl-Eric Reif’s The Hockey Compendium, that one of their sources, Edward Yuen, had compiled completely different shots-on-goal records than Tremblay or the NHL. Yet another statistical compilation, The Hockey Summary Project (http://www.flyershistory.com/cgi-bin/hspgames.cgi), sometimes had different results as well. In other words, for me to compile my own goaltending stats, I would have to figure out which stats were correct, even though I had four different sources each contradicting the other, and that’s not even counting the various Bay Area newspapers of the era. So the long search for the truth began, as I sifted through Bay Area newspapers such as the Oakland Tribune, San Mateo Times, Fremont Argus, Hayward Daily Review, as well as the Winnipeg Free Press for game summaries that would straighten everything out. I discovered there were all kinds of anomalies concerning the old Seals. The following season, the Seals discarded several players they had picked up in the expansion draft and replaced them with productive veterans and youngsters looking to prove themselves. The team vaulted into second place in the West Division. Smith replaced Hodge as the Seals’ number one goaltender, and he established all-time club records for wins and shutouts in a season. Unfortunately, Smith was stiffed by the NHL when it comes to his record-breaking season. The league claims Smith compiled a 21-24-7 record in 54 games, when in reality he compiled a far better 22-20-7 record in the same number of games. Smith’s record is significant because it is the only time in the Seals’ nine-year history that a goaltender compiled a winning record. Let’s give “Suitcase” a little love here! The Seals’ first-season coaching records are just as inaccurate as the goaltending stats. Bert Olmstead was the team’s first coach and general manager, but it was a trying season for the hard-nosed Hall-of-Famer. Players did not put forth the effort he expected from them, the Seals didn’t score nearly enough goals to be competitive, and attendance was lousy. There were constant rumours the Seals would be relocated to Vancouver for the 1968-69 season. On February 7, 1968, Olmstead resigned. “Olmstead has decided to let his assistant, Gordon Fashoway, run the club for a few games to see if he can get it back in the running for a Stanley Cup playoff berth,” said the Fremont Argus (1). Those few games turned into the rest of the season as Olmstead never returned behind the bench in Oakland, or elsewhere in the NHL. At the time of the coaching change Olmstead’s record was a sorry 10-32-11, but the NHL incorrectly states Olmstead’s record behind the bench as 11-37-16, which is absolutely impossible as he was not even available to coach that many games. For instance, the March 11, 1968 San Mateo Times says, “Olmstead’s mother died in Saskatchewan. Olmstead has been back in Canada since learning his mother was gravely ill” (2). Unless Olmstead had superpowers that allowed him to be in two places at once, there is no way he could have coached the Seals and attended to his sick mother. The most obvious piece of evidence that proves Fashoway finished the season behind the bench is an April 14, 1968 Oakland Tribune article that states, “With 21 games left, [Olmstead] turned over his coaching duties to aide Gordon Fashoway. The latter’s record was five wins, 10 losses, and six ties” (3). NHL record books have always claimed Fashoway’s record is 4-5-1, but this, of course, is false. How many other coaching and goaltending statistics are inaccurate is unknown, but based on a simple research of one short-lived expansion team, and finding so many mistakes in the official records, who knows what other inaccuracies exist. One thing is sure: it would be a Herculean task to sort everything out. (1) “Assistant to Pilot Seals,” Fremont Argus (February 8, 1968), p.11. (2) “Ice Chips,” Oakland Tribune (March 11, 1968), p. 21. (3) “Seals Fire Coach Bert Olmstead,” Oakland Tribune (April 14, 1968), p. 43.